I’ve always had a big time passion for traveling. I mean, when I wasn’t even born, I was traveling to Germany on a regular basis, so who could blame me? By now, I visited over 35 countries all over this planet and just this year was on 12 flights - which makes approximately 3 flights per month. I often get asked if I have any tips or learned anything as full-time traveler (well, that’s not really true since I am a full-time university student on the side), however I still have some tips on how to survive ANY flight - and those I would like to share in this post! Už od mala jsem poměrně často cestovala. Už ve 12 jsem pravidelně pendlovala mezi Německem a ČR, a od té doby, co jsem si založila blog, se snažím cestovat na maximum. Za těch pár let jsem nasbírala spoustu "cestovatelských" zkušeností a právě o ty bych se s Vámi dnes chtěla podělit. Jenom minulý rok jsem letěla celkem 35x a nezahálím ani tento rok - prozatím jsem byla na 12 letech během 3 měsíců! So, since I am considering myself as a personal style / fashion blogger, I would like to start with fashion, obviously. I know that every single fashionista in here wants to look on the fleek while traveling, however let me tell you one thing: why not to be fashionable while being comfortable as well? For me the ultimate long-flight outfit is my suit paints, a simple top with a cropped knit, my Balmain blazer and my Gucci sneakers. For short-flights (anything less than 3 hours) I like to wear my skinny jeans or my leather leggings by Balenciaga together with a comfy knit - recently I fell in love with this pink, leopard sweater from the limited LVR 17 edition in collaboration with Krizia. Not only I think this is something a little different, yet the quality is really amazing and makes the knit really cozy and cuddly. For me, this is the perfect combination of being fashionable, yet super-comfortable. For me, it is really important to be comfy while flying and I think that this knit has it all! Jelikož móda hraje v mém životě velkou roli, chtěla bych začít tím, co si na let obléct. Myslím, že v této situaci jde hlavně o komfort - zároveň si ale myslím, že se můžete obléci pohodlně a být zároveň šik. Já nejraději létám v legínách nebo v "kostýmových" kalhotech. K nim si vžycky obléknu pohodlný svetr - v poslední době jsem si oblíbila tento vlněný z limitované LVR 17 edice ve spolupráci s designérem Krizia. Myslím, že je to zase něco jiného. Co se bot týče, nejraději létám v kotníkových kozačkách nebo teniskách! Rozhodně bych se vyvarovala šatům i sukním, krátkému rukávu a otevřeným botám. I, personally, prefer booking on the official site of the airlines. I know that sometimes you can get a better deal as some 3rd party, yet if you book in advance and on the official site of the airline, you can get a special bonus in your flyer program, which you should definitely take advantage of! Osobně bookuji letenky většinu přímo u aerolinek - většinou za letenky dostanete bonus v zákaznickém programu a cenový rozdíl je minimální. Another big topic I would like to talk about is the loyalty programs and the lounges. I am, personally, registered in every single loyalty program I can imagine. I have a Miles&More account (Lufthansa, Condor, Euro Wings, etc. ), SkyTeam account (Czech Airlines, Delta, KLM, Air France, etc. ), registration at Emirates or membership by Etihad (Etihad, Air Berlin), and many many more. I know it might sounds silly if you don’t flight that often, however if you - for example fly twice over the ocean in 2 years, you can collect some pretty good miles and choose a seat for free or get a special meal complimentary. I know, these are not big things, but why not to get an advantage of it? If you really wanna become a silver, gold or platinum member, you really have to choose only ONE airline or ONE airline within a sky alliance and collect your points there. I know that I am, personally, traveling the most with the Sky Team, aka all my flights to Barcelona, Paris, Amsterdam or Düsseldorf are Sky-Team based, so I decided to collect my points by the Czech Airlines. At the moment I am a silver member, which I allows me to be a Sky Priority passenger on any flight within the alliance, have complimentary luggage in limit of 26kg, have a priority on the waiting list and many more. Recently I was also surprised by a lovely upgrade on my flight - which is something I did not request or paid extra for - simply I got upgraded just like hat by the Czech Airlines (btw this content is NO WAY SPONSORED by them), which I think was a nice gesture. I think if you really want to be “SOMEONE” in the airlines programs, you have to chose your favorite alliance and stick with them! Also, let me talk about the airport lounges. Before I visited the first one, I’ve always felt like it was a waste of money - but let me telly you one thing. It is actually not a waste at all. You can join several programs in order to get a free access to the lounges. For example at my home airport in Prague I have an access to the lounge just by having a special type of credit card. At the rest of the airports, I am usually using my “Priority Pass” card, which allows you to have 4x free entry to their lounges, and in 2 of those you can bring +1 for free as well. I think this is a great way to spend your time at the airport - in the end, we can all face it - you’re gonna spend the entry fee anyways, so this is a more comfortable anyways…. Další bod, který bych chtěla zmínit, jsou právě zákaznické programy a letištní salonky. Já osobně jsem zaregistrovaná v celé řadě programů - myslím, že má smysl se zaregistrovat ikdyž nelétáte často. Myslím, že pokud chete dosáhnout vyššího statusu, vyberte si jednu aerolinku (nebo jednu kolaboraci aerolinek jako One World nebo Sky Team), a v ní sbírejte body. Já osobně nejvíce létám s již zmiňovaným Sky Teamem. Všechny moje lety do Paříže, Barcelony, Düsseldorfu i přes oceán jsou většinou provozované jedním z partnerů, a tak jsem si vylétala již stříbrný status. Díky němu mám zavazadlový limit o 3kg větší, mohu si zadarmo odbavit kufr navíc, mohu se odbovit na přednostní přepážce nebo mám také prioritní nástup do letadla. Na posledním letu dostala dokonce upgrade do třídy Business zadarmo, takže určitě se podle mě registrace vyplatí. Zároveň bych také chtěla něco málo říct o letištních salóncích. Vždycky jsem si myslela, že to jsou "vyhozené" peníze, ale teď musím přiznat, že je to skvělý způsob, jak si čekání na letišti zkrátit. Pokud plánujete jíst nebo pít, myslím, že se Vám vyplatí si zaplatit vstup do salonku, kde kromě jídla a pití, máte také svoje soukromí, komfort a i jiné služby. Já jsem držtelem "Priority Passu", díky kterému mám 4x ročně vstup do vyraných salonků zadarmo, přičemž 2x mohu přijít zadarmo +1. 1. Keep all of your expensive and most important things in your cabin carry-on. I wouldn't leave my designer goods in the checked-in lugagge. Unfortunately my suitcase got already stolen once, with no refund. 3. Bring an emergency box with medicine. If you have the chance, bring some pills with you - I am always bringing pain killers, headache killers and another drugs, sothat I avoid going to the doctor. 4. Bring some "emergency" clothes on board in case your suitcase gets lost - besides all of my expensive stuff, I am also always putting some extra underwear and clothes in my carry-on as well! Od té doby, co mi byl odcizen kufr (přičemž jsem nebyla odškodněna), si dávám pozor, kam si dávám drahé věci. 1. Všechny drahé a důležité věci si zabalte do příručního zavazadla. Já bych například elektorniku, prášky, drahé kabelky a luxusní věci do odbaveného zavazadla nedala. 3. Zabalte si s sebou malu lékarničku, která Vám v nouzi bude nejlepším přítelem. Já si vždycky s sebou balím prášky na bolest, kapky do očí, kapky do nosu a někdy i antibiotika a jiné léky. 4. Na palubu si vezměte i nějaké oblečení pro případ, že se Vám kufr ztratí. Já si do kufru beru například spodní prádlo nebo plavky. The first thing I am doing after buying a flight, I am always trying to choose a seat ahead. My favourite seat is at the window, so I always wanna make sure that's where I am sitting at. What is worst than being trapped for 9 hours at the middle seat?! So, anything below 3 hours feels like nothing. You enter the plane, you depart, you fly for 1, 2 hours and you’re about to land. Trust me, short-distance flights feel like nothing. I was always scared to fly on my own “in case something happens”, yet (thanks homy beloved boyfriend who decided to go LDR with me), I’ve lost this fear pretty quickly. I think the best you can do on a short-time flight is to use the time to do your rests or work - if you’re in university, just take a loot at the most recent presentation by the professor you don’t like. And if you’re working, just prepare that super-important document right here, right now. I think flying and working is actually combinable - actually even this post was written on my way from Prague to Düsseldorf. So here’s the big deal - anything above 3 hours feel really LONG and BORING. Ok, let me telly you one thing - the airlines you fly with can make a BIG TIME DIFFERENCE. 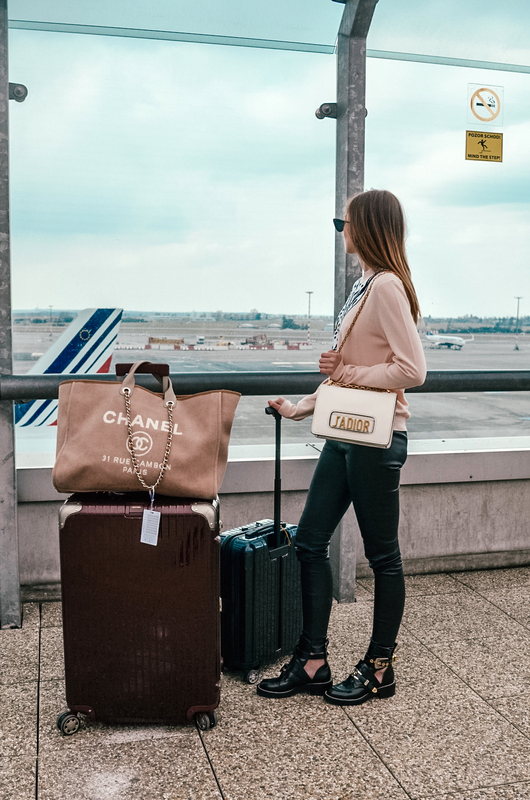 For my long flights, depending on the destination, I like to choose airlines like Emirates, Air France, KLM or Delta, because I know I can get the comfort I need in there. I know what to expect in the plane (space-wise, food-wise, technology-wise, drinking-wise, etc. ), so I think even paying an extra amount to those airlines makes sense. In the plane itself you can use the time wisely and you can for example finish that work presentation, prepare yourself for your next exam or read a book. Watching a movie is always an option, just like playing games or listening to the music. Trust me, in the end, the flight will be doable! Let kratší jak 3 hodiny uteče opravdu rychle. Já na kratších letech většinou pracuji - píšu blogové posty, upravuji fotky, připravuji si dokumenty nebo doháním resty ze školy. Někdy se zabavím jenom hrami na telefonu a let mi uteče. Pokud se chystáte na delší let, nemusíte se bát - i tam najdete něco, co můžete dělat. Stejně tak jako na krátkém letu můžete čas využít k práci nebo k dokončení věcí do školy. Vždycky si můžete pustit pár filmů, poslouchat hudbu, zahrát si hry, spát nebo si třeba přečíst knížku. Hlavně nezapomeňte na pitní režim a hydrataci pleti! So so agree about comfy clothes and better airline company! Anyways, when you take the cheap one, you end up paying even more for food, luggage etc. I found myself once to pay for my HAND BAG at the flight by Easy Jet from Nice to Paris as they considered it as a cabin luggage!! Zaregistrovat sa do programu sa vazne oplati- uz som za nazbierane body letela na Havaj :-) Aj s pohodlnym oblecenim suhlasim, len nechapem, preco si si obula balenciaga topanky, o ktorych si pisala, ze v nich nevydrzis viac ako pol hodinu a su OPRAVDU OPRAVDU nepohodlne. Ci to len kvoli fotke? That's the only direct flight from Prague to the US, so there are no other options. I flew business and they were amazing actually. Better than Air France, which surprised me.